Mary Wollstonecraft Shelley (1797-1851) was the daughter of Mary Wollstonecraft and William Godwin, the wife of Percy Bysshe Shelley, and the author of one of the most widely read and often redacted novels of the past two centuries. 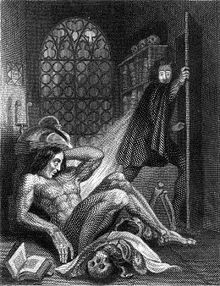 Frankenstein; or, the Modern Prometheus was born out of a series of conversations she had during the summer of 1816 with Percy Shelley, Lord Byron, and Dr. John Polidori. Mary cites conversations between Shelley and Byron about Erasmus Darwin (“they talked about the experiments of Dr. Darwin“) and Luigi Galvani (“perhaps a corpse would be re-animated; galvanism had given token of such things”) as sources for her own idea of a reanimated human (“perhaps the component parts of a creature might be manufactured, brought together, and endued with vital warmth”) in her introduction to the 1831 edition of the novel (first edition 1818). When asked to explain why he has created a monstrous life form (one that would eventually destroy him), Mary’s Victor Frankenstein offers an explanation based on the concept of “species.” “A new species would bless me as its creator,” he says to Captain Walton in the opening pages of the novel. In 1816, Mary Shelley penned a famous sentence that offered a natural historical explanation for Victor Frankenstein’s desire to create a new sort of living being: “A new species would bless me as its creator and source; many happy and excellent natures would owe their being to me” (Robinson I: 85). The line appears in the original 1818 edition (Hunter 32) of the novel and unaltered in the revised version of 1831 (Smith 55). In Charles Robinson’s recent facsimile edition of the manuscript, “species” appears to have been Mary Shelley’s third word choice after “creation” and “existence” (I: 85). 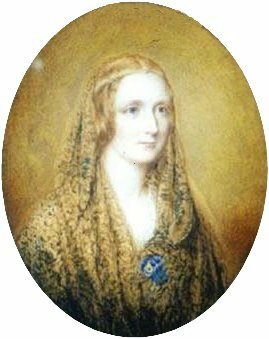 Much recent scholarship has emphasized Mary Shelley’s biography and state of mind during the Frankenstein summer. Additional work on the novel has analyzed the scientific advances of the era; both Galvani and Volta were experimenting with electrical impulses and muscular contractions during the 1790s. Less attention has been given to an equally important question: what precisely did Mary Shelley think the word “species” meant in 1816, and how did her sense of the concept of species relate to a wider Romantic natural history? Frontispiece, 1831 edition of Frankenstein. Mary clearly sees this attempt to create life as connected to the creation of a species. Of course, Victor does not really create a new species at all; he creates a hybrid, a human being composed of the parts of other humans and other animals, since some of his raw materials come from the “slaughterhouse.” Mary’s creature presumably lacks a soul, at least in the minds of most of her 1818 readers. But when Victor considers the “race of demons” that might populate the world if he goes through with his plan to create a female companion for the “wretch,” he clearly places monster reproductive biology at the center of his own anxieties. As readers, we may well wonder why he does not merely create a “sterile” female. We may also wonder why he created a fertile male creature in the first place. If he has the power to create life, surely he has the power to create individuals unable to reproduce. Or perhaps this textual confusion reflects 18-year-old Mary Shelley’s confusions about reproductive biology–even though she had already given birth to one child that died only days after it was born. All such reproductive anxieties however, point to wider issues and questions about the problem of speciation in the Romantic era. By the time Mary Shelley claims that a “new species” might bless a human creator for its existence, Romantic poets and writers were hinting at the biological connectedness of all living things, even without the precise scientific details that would allow them to explain such links. When Coleridge refers to the “one Life within us and abroad, / Which meets all motion and becomes its soul, / A light in sound, a sound-like power in light,” (“The Eolian Harp,” 26-29), he is clearly imagining a naturalized version of divine unity. Erasmus Darwin might have called Coleridge’s “one Life” a “vegetative” energy that pervades and links all living things (“all objects of all thought / And rolls through all things” as Wordsworth would add [“Tintern Abbey” 102-03]). In “The Eolian Harp,” Coleridge imagines “all of animated nature” as “organic Harps diversely fram’d,” and he refers to the animating principle as “Plastic and vast.” The phrase “animated nature” was used widely by natural historians to distinguish those aspects of creation that were responsible for their own motion (anima: breath, wind) from inanimate (spiritless) objects. The phrase also hinted at some unifying vital principle that separated living from nonliving things. Of course, Victor Frankenstein’s creature does not bless him “as its creator.” In fact, the wretch turns on the creator and destroys him–as well as everyone he loves–not because the monster is inherently evil, but because the “monster” never receives love from his creator, or even a name. The human creator Victor never shows sufficient concern for the life he has made, much less for other human (or animate) lives around him. Mary Shelley’s message points toward respect for life–all life–as a crucial aspect of Romantic natural history. 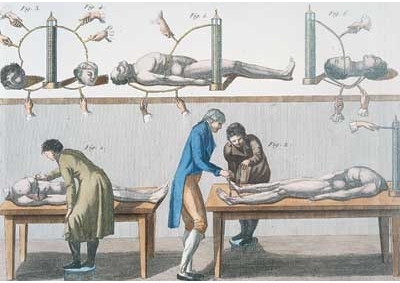 Mary had seen images like this, of Aldini's experiments "re-vivifying" recently dead corpses, close to the time that she "imagined" the first details of Frankenstein.